The Reno / Lake Tahoe region has one of the largest concentrations of top downhill ski resorts in the world. Perched on the slopes around Lake Tahoe, these skiing areas are also blessed with abundant snow, excellent accommodations, and easy access from Reno, Sacramento, and the Bay Area. Tahoe Donner Downhill Ski Area - 11603 Snowpeak Way in Truckee, west of Reno at the Donner State Park exit. 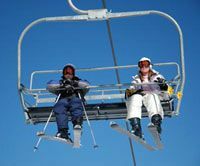 Special Events and Activities on the Slopes - The downhill skiing and snowboarding resorts in the Lake Tahoe area near Reno have a number of special events and activities during the ski season. From goofy stuff just about anyone can have fun with to serious competitions for experienced skiers and snowboarders, there is something of interest for virtually every visitor to our nearby snowy Sierra Nevada mountains. In addition, look for deals on lift tickets and save money when you head for the slopes.